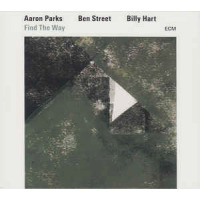 Find the Way is pianist Aaron Parks' eighth release as a leader and second on the ECM label. The prolific artist has appeared as a sideman on thirty-eight albums dating back to 2003, working frequently with Terence Blanchard, recording with Joshua Redman and Kurt Rosenwinkel and many other top names in jazz. At the age of fourteen, Parks was studying music and computer science at the University of Washington and has gone on to win multiple awards including sharing a Grammy for Blanchard's A Tale of God's Will (A Requiem for Katrina) (Blue Note, 2007). Parks' ECM debut, Aborescence (2013), was a critically acclaimed solo outing that highlighted his deceptively nuanced flair for intricate harmony. On Find the Way he returns to a trio formation to convey his intricate vision. A complete resume on Billy Hartwould fill a book. The tireless, veteran drummer, he's been a leader since Enchance(Horizon, 1977); one of eleven such releases. He has anchored rhythm sections in groups that covered the jazz alphabet from John Abercrombie to Joe Zawinul. Hart and bassist Ben Street are well acquainted having recorded together on three recent Hart albums including Hart's last two ECM outings All Our Reasons (2012) and One Is the Other(2014). Hart is key in shifting the dynamics throughout the program, quickly evident in the varying subtleties of the opening pieces "Adrift" and "Song for Sashou." "Unravel" is a balancing act between rich melody and somewhat more outside lines. "Hold Music" begins with an extended Hart solo focused on the tom-tom before Parks eases the piece down to a ballad. Parks modeled "Alice" on the compositional style that Alice Coltrane employed with the tune "Ptah the El Daoud" from her under-recognized album of the same name (UMG Recordings, 1970). More upbeat and exotic is "Melquíades," named for a character in a Gabriel García Márquez novel. The title track closes the album as it began—lyrical but slightly elusive. Parks expressed his awareness of the ECM aesthetic, and at points looked to emulate that increasingly broader sensibility. The music certainly fits in the label's eclectic catalog nicely but because Parks is not given to over-the-top drama, the simplicity and polish in Find the Way demands closer attention to appreciate some thorny time signatures and moody textures. Parks proves that classic lyricism need not be played out as a relic of the past. Adrift; Song for Sashou; Unravel; Hold Music; The Storyteller; Alice; First Glance; Melquíades; Find The Way. Aaron Parks: piano; Ben Street: double-bass; Billy Hart: drums. The road that connects Brazilian music and jazz—the essential thematic nexus on this collaborative venture that brings bassist Ron Carter (and his quartet), vocalist Vitoria Maldonado, Ruria Duprat's Brasilian Orchestra, and a handful of guest soloists into the same line of thinking—has always been a two way street, as both forms benefit and borrow from one another. Those on the jazz side have often found new harmonic angles to explore, gently undulating rhythms to coast upon, and beautiful songs built with extreme sensitivity in the Brazilian canon; and those on the Brazilian side have reveled in the opportunity to inject the unexpected into set forms and bring swing rhythms into contact with songs from their native land. All of those aspects born of the comfortable union between the two are audible in the material presented on this easy-on-the-ears date. Carter and his quartet get first billing here, but they typically play second fiddle to the co-headliner. Maldonado's voice—a sweet, expression-rich instrument—is at the center of these performances. She sings in English, Portuguese, French, and wordless forms; she sways with the bossa beats, soars with spirit, and seduces in soft environs; and she evinces the beauty and positive spirit connected to the meaning of the acronym in the album's title—"Love, Inspiration, Knowledge, Energy." Her greatest strengths seem to be connected to standards with a bossa twist and material endemic to Brazil. Soulful suggestions ("Georgia On My Mind") and swinging sections of music don't suit Maldonado nearly as well as fully Brazilian-ized American standards ("How High The Moon," "There Will Never Be Another You") or star-kissed beauties born of her own mind ("Adoro O Teu Sorriso"), but she manages just fine in every setting. While the spotlight remains focused on Maldonado for much of this program, Carter and his bandmates are able to shine, both as soloists and support players. Percussionist Rolando Morales-Matos and drummer Payton Crossley get the album rolling with some exciting exchanges ("They Can't Take That Away From Me") and provide steady rhythmic framework for others to build around; pianist Renee Rosnes proves to be a tremendous asset, capable of mesmerizing when she steps forwards ("How High The Moon"), providing a harmonic compass for all to follow, accentuating the mood of a song, or fading into the distance when need be; and Carter remains a model of class, support, and musicality. The bassist-leader is always focused on "finding the right notes," to borrow the title phrase of his biography, and that search always yields stellar results. Whether soloing, interacting with Maldonado, or anchoring the ensemble, Carter comes off as the consummate artist and professional. And then there are the guests to admire. Randy Brecker's flugelhorn graces a single track, Marcos Mincov's English horn adds achingly beautiful commentary to two Maldonado originals, and several other notables, like guitarist Roberto Menescal, step into the mix at one time or another. Those looking to hear Carter and company let loose in a small group setting will be better served by going elsewhere, but those who see the appeal of a beautifully-shaped program that puts singer, small group, orchestra, and guests on near-equal footing will likely enjoy getting lost in this music. They Can't Take That Away From Me; There Will Never Be Another You; Night And Day; I Only Have Eyes For You; How High The Moon; Adoro O Teu Sorriso; All Of Me; Que Reste-T-Il De Nos Amours (I Wish You Love); Georgia On My Mind; Someone To Light Up My Life; Lugar Comum; Because You Make Me Dream; Saudade. 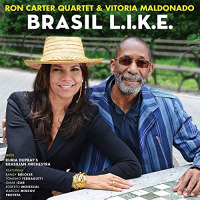 Vitoria Maldonado: vocals; Ron Carter: bass; Renee Rosnes: piano; Rolando Morales-Matos: percussion; Payton Crossley: drums; Roberto Menescal: guitar; Marcos Mincov: English horn; Toninho Ferragutti: accordion; Omar Izar: harmonica; Randy Brecker: flugelhorn; Proveta: alto saxophone; Ruria Duprat: arrangements, conductiong; Ruria Duprat’s Brasilian Orchestra—Luiz Britto Passos Amato: violin; Alex Braga Ximenes: violin; Otavio Scoss Nicolai: violin; Andrea Araujo Campos: violin; Nadilson Gama: violin; Flavio Geraldini: violin; Adriano Mello: violin; Marcos Henrique Scheffel: violin; Maria Fernandez Zagatto Krug: violin; Paulo Calligopoulos: violin; Heitor Fujinami: violin; Matthew Thorpe: violin; Alexandre Zappelini De Leon: viola; Elisa De Lina Do Rego Montiero: viola; Roberta Lizandra Marcinowski: viola; Fabio Tagliaferri: viola; Adriana Cristina De Barros Holtz: cello; Gustavo Pinto Lessa: cell; Patricia Mendonca Ribiero: cello; Maria Eduarda Leitao Canabarro: cello; Mario Sergio Rocha: French horn; Vagner Reboucas Da Silva: French horn; Rogerio Carvalho Martinez: French horn; Vitori Ferreira Neves: French horn; Marco Antonio Cancello: flute; Michel De Paula: flute; Clarissa Lapolla Bomfim Andrade: flute; Carlso Marcelo Nogueira Barboza: flute. 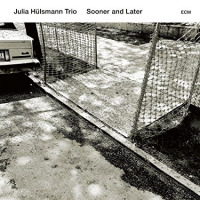 After expanding to an instrumental quartet—a quintet, with the vocalist Theo Bleckmann included—pianist Julia Hülsmann returns to a trio formation on her fourth ECM release, Sooner And Later. Bassist Marc Muellbauer and drummer Heinrich Köbberling have been part of that core through the previous three ECM outings, The End of a Summer (2008), Imprint(2011) and A Clear Midnight—Kurt Weill and America (2015) as well through Hülsmann's ACT Music years. Despite a long, productive career and considerable recognition in Europe, Hülsmann is not well known in the US. A native of Bonn, Germany, she has been playing piano since the age of eleven. After moving to Berlin in the early 1990s, Hülsmann joined a jazz orchestra and later went on to record several albums with her trio and a succession of vocalists. A teacher at the Jazzinstitut Berlin, Muellbauer—a London native—has a broad cross-genre background that includes classical, jazz and tango music. He leads the ensemble Kaleidoscope, originated the Wood & Steel Trio and plays with the Lisbeth Quartet. Köbberling, a German born drummer and educator, has worked with some high profile jazz artists including Aki Takase and Anat Fort and was leader on Pisces (Nabel, 2002) with Marc Johnson, Ben Monder and Matt Renzi. With more than a decade of collaboration, it shouldn't be surprising that the trio—all composers in their own rite—contribute pieces that are an intrinsic blend of their own strengths and those of the group. The opener, "From Afar" and the subsequent "Thatpujai" are subtle and sophisticated, very much in the vein of more familiar ECM piano trios. A perennial favorite rock source among jazz performers, Radiohead's "All I Need" opens with a beautiful duet from Muellbauer and Hülsmann before Köbberling quietly works his way in and gradually moves the piece up tempo. "You & You," "J.J." and "Later" are more challenging conventions and demonstrate a willingness to push the envelope. Sooner And Later is an album that grows in appeal with repeated listening. The trio masters interplay and while that dynamic takes precedence over solo time, there are numerous opportunities to appreciate each of the players individually. The quieter moments are warm and enveloping, each with a distinct personality. Where the trio displays their more energetic side, they show a brilliance for creating complex and highly engaging melodies. Sooner And Later is a significant achievement for a trio that had set a high bar, long ago. From Afar; Thatpujai; You & You; Biz Joluktuk; All I Need; The Poet (For Ali); Offen; J.J.; Soon; Later; Der Mond. Julia Hülsmann: piano; Marc Muellbauer: double bass; Heinrich Köbberling: drums. Camila Meza, from Santiago, Chile, started as a bit of a phenomenon at home. She was a musical standout in school and began gigging as a young woman, singing and playing guitar. If she started as a classic rock and singer-songwriter fan, then it didn’t take her long to begin singing standards like Ella Fitzgerald and playing a hollow-bodied guitar like Wes Montgomery. Of course that’s what young artists do. But, if they’re not careful, they keep doing it for way too long: copying, learning, living in the shadows of their elders. Meza, however, had other plans. She left home at 23 for New York and the New School in 2009, studied with Vic Juris and Steve Cardenas among others, and started playing with everyone all over town, including a recent stint with Ryan Keberle’s band Catharsis, with which she has recorded two excellent albums. Traces is her third outing as a leader but her first in New York. The trio behind her (Shai Maestro on keys, Matt Penman on bass, and Kendrick Scott’s drums) is fleet and fantastic, and she supplements it with some harmony vocal from Sachal Vasandani, as well as percussion and cello. But at its core, this is a quartet record that puts Meza out front as a singer, a songwriter, and a guitarist — with both strong and appealing ideas in each role. The first three songs out of the chute are all Meza originals, and they arrive in a flurry of sparkling melody and rhythmic appeal. Her band is not gimmicky or “smooth” — that is to say, this is not commercially calculated “jazz”. But the ensemble has the sparkle and snap of the bands of Meza’s early hero, Pat Metheny, making this exceptionally accessible and appealing modern jazz despite coming from a small label and lacking any of this season’s signals of commercial appeal: hip hop credentials, connections to soul music, gritty backbeats. The opener, “Para Volar”, features a hooky four-note motif that rides above a bubbling stream of Latin groove. The band is precise and acoustic, negotiating melody and harmony with ease. Mesa’s guitar tone is mostly clean and bright, and she pairs it with her voice here like they were blue sky and sunshine: cool and bright at once. “Away” adds cello and sounds a bit more like a kind of chamber pop ballad, but the music picks up a percolating Latin jazz float a the midpoint, with electric piano candy underpinning the vocals. The third song, the title track, adds a new rhythmic feel: a beguiling snap of funk relieved by a more complex jazz groove build on precise written bass lines and complex harmony. As a songwriter, then, Camila Meza is not going to be pinned down. She writes lyrics in Spanish and English, and she writes music across genres. It sounds of a whole, however, because her two voices — as a singer and as a guitarist — are strong. Vocally, Meza is deft and not obviously brilliant but grows on your ear: modest of tone but fleet in phrasing. If you’re looking for a bag in which to place her, you’ll be stymied. Her voice is plainspoken and clear, arguably akin to recent young jazz singers who sound less like a classic “jazz” singer such as Becca Stevens. That is to say, Meza is not like the talented but oh-so-throwback-sounding Cecile McLorin Savant, whose updating of Sarah Vaughan is big at Jazz at Lincoln Center but sounds unaffected by the last 50 years of jazz singing. Her instrument, however, is less affected than that of Gretchen Parlato, less soul-driven than Somi, and less avant-pop than Cassandra Wilson. Meza manages to suggest her connection to Ella and Joni Mitchell at the same time while being tied to singing from other cultures too. The current singer she reminds me of most may be Luciana Souza, from Sao Paulo, Brazil. I particularly like the vocal performance on the Meza original, “Mar Elastico”, where Meza moves quietly in her lower and middle registers with intimacy, a bit breathy but still clear as a bell, pulling a variety of colors from the melody that are beautifully complimented by an atmospheric arrangement that particularly features Scott’s drums. Though she is not mainly an interpreter of classic material, I love that the one Broadway “standard” Meza has chosen for this band is “Greenfinch and Linnet Bird” from Stephen Sondheim’s Sweeney Todd. It is a song about being captive, sung by the demon barber’s daughter in what is often an underwhelming moment in most Todd productions. Meza’s version may be the fist ever to actually have the momentum and urgency to suggest flight and escape. She sets it up with propulsive guitar lick, but the arrangement then blossoms into a skipping jazz waltz. The singer’s own guitar improvisation on “Greenfinch” takes off in lyrical beauty but really flies because Meza is a profoundly swinging player whose rhythm flutters and jumps against her band’s polyrhythmic groove. The song makes you believe in liberation — in part from the overstudied way that Sondheim songs usually come off in the hands of jazz musicians. The other spectacular cover here is Meza’s closing version of “Little Person”, which is a tune from the intriguing Charlie Kaufman movie Synechdote, NY, written by Jon Brion. The original was a subtle stride piano feeling, and Meza keeps things simple here, accompanying herself on guitar only, offering up something as tender and heartfelt as jazz has to offer these days. There are plenty of treats on Traces, but the best news is that so many of the songs are just as beautiful as they are complex, just as appealing as they are urgent. Little moments — such as the unison scatting with acoustic piano in the middle of Meza’s original “Mangata” — pop out as gleaming gems on the beach of her music. It doesn’t hurt that the song just has a great melody and hook, all while still clearly being some kind of “jazz”. Camila Meza is just the latest evidence that this music — stereotypically thought of in today’s culture as fussy, niche, over-elite, cold, old — is capable of crossing every barrier. There’s an audience for this kind of beauty, melody, invention, flight. Find Camila Meza, please, folks. While unboxing guitarist Will Bernard’s delightful latest offering Out & About a few months ago, it wasimpossible not to rave on the key contributions of his combo’s organist Brian Charette. Charette has regularly put in stellar supporting roles whether it’s for Posi-Tone Records stablemates like Bernard or any jazz leader of note in need of some maximal Hammond B3. And that speaks nothing of Charette’s playing when Charette is in charge of the sessions: he once had the audacity to put his organ alongside four horn players (Music For Organ Sextette) that ended up being one of the most inspired organ jazz record in recent years. Once & Future (Posi-Tone, June 3, 2016) doesn’t reach for such levels of risk-taking but it does offer the occasion of hearing Charette again trading licks with Bernard, only with the leader/sideman roles reversed. No horns this time as Charette’s group is reduced to the tried-and-true organ/guitar trio (Steve Fidyk brings the drums). As a noted educator of the B3 (he writes instructional books and articles, conducts masterclasses and teaches at workshops), Once & Future can be thought of as a ‘clinic’ record where he touches on many of the various techniques of the jazz organ as well as many shades of sub-styles, from Jimmy Smith to Larry Young. In keeping, only three of these fourteen tunes are his and many of the rest might be familiar to you. They may also titillate with Charette’s manner by which he carries these songs. He begins paying homage to perhaps the original organ jazz great, Fats Waller; “Jitterbug Waltz” is a 3/4 swing that might be common in mainstream jazz but for some reason isn’t done as often where an organ is involved. At least not with the lilting grace that Charette seems to do so effortlessly. But he can get funky like the best of them, too: Jack McDuff’s “Hot Barbeque” captures the fun of the original’s boogaloo. Charette’s take on James Brown’s “Ain’t It Funky Now” evokes Grant Green’s, but his nasty solo is actually a nod to the late Deep Purple organ giant Jon Lord. Homage to Young is played on a number written by Woody Shaw, “Zoltan,” which had launched Young’s masterpiece album, Unity. Charette’s solo here is astonishing, he picks up where Young left off and takes it higher. Bud Powell of course wasn’t an organist, he was bop’s most important pianist. But Charette takes on his “Dance of the Infidels” with the right bright attitude and of course, that swing. Jimmy Smith’s “Mellow Mood” is undertaken with Charette not so much recalling Smith as the exotica expressions of Korla Pandit, a twist that like everything else Charette attempts in these sessions, lands on its feet. Bernard wasn’t brought on to be a bystander and he delivers tasty blows on Larry Young’s “Tyrone,” goes on one mean blues streak for “96” and gets it square in the pocket for “Ain’t It Funky Now.” Fidyk was given a tall task to pivot from swing to funk to Latin to Elvin Jones’ unique polyrhythmic swing on “Zoltan,” and is never less than rock steady. 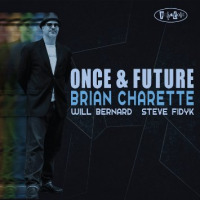 Brian Charette gave aspiring jazz organists a lot to chew on with Once & Future but as is evident from my thoughts above, you don’t have to be a student of the instrument to appreciate this record. It’s the perfect record for aspiring (and accomplished) organ-jazz listeners as well. Jitterbug Waltz; Tyrone; Latin From Manhattan; Da Bug; At Last; Hot Barbecue; Dance Of The Infidels; Zoltan; The Scorpion; Falling Fourth; Ain't It Funky Now; Mellow Mood; Road Song; Blues For 96. Brian Charette: organ; Will Bernard: guitar; Steve Fidyk: drums.